Moscow is set to host its third snowboarding World Cup event at the weekend, with one of the most popular winter genres, the parallel slalom, due to take place right in the heart of the city. ­Snowboarding has never been more popular in Russia. The country possesses some of the world's best snowboarders, especially on the women's side. On Saturday, Russian fans will have the rare chance to see them in action as Moscow plays host to the latest leg of the snowboard World Cup. “The slope here is on the short side, and everything will happen very quickly, and I am really counting on the fans to give me a boost. It's really nice to be able to race at home, here in Russia, where everything is so much closer than having to travel abroad, while my parents and friends will be able to come along and watch,” Russia’s Svetlana Boldykova, two-time World Cup winner, said. In fact, all the top stars are in Moscow, including a number of Russia's very best. However, there's one name missing – Alyona Zavarzina, who's out with injury. Nevertheless, the home crowd will still be able to see the likes of Ekaterina Tudagesheva, who's establishing herself as one of the world's very best in the parallel slalom discipline, as well as the likes of Svetlana Boldykova and Ekaterina Ilyukina, who won a silver medal at last year's Winter Olympics in Vancouver. All is well in the Russian camp ahead of the big day on Saturday. “The weather wasn't great today, but when the competition gets underway, I hope it will be sunny and clear. I am still getting used to the slope, as it's the first time I have practiced on it. But come Saturday, I think everything will be great,” Boldykova added. Winter sports in Russia will only continue to grow in stature with the Sochi Olympics due to get underway in just three years time. The track may be slightly on the short side, in comparison to most World Cup events. Nevertheless, its location will make it easy for thousands of fans to attend. 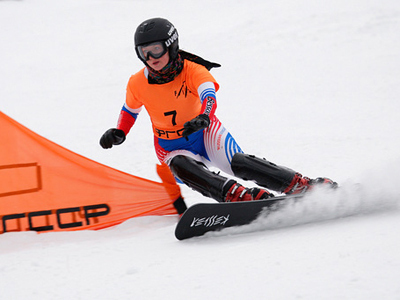 And the Russian snowboard federation is just happy, to continue to help raise the profile of the sport in the country. “We decided to hold the event at Vorobievy Gory because it's one of the most historic spots in Moscow. We’ve had practice holding events here, as this slope has held the Russian snowboard championships before. We got the go-ahead to hold the last leg of the World Cup here from the international skiing federation, and everything is going according to plan,” Aleksey Kurashov, general secretary of Russian Snowboarding Federation, said. While Russia's male snowboarders still have some catching up to do to be on a par with their rivals from Europe and North America, there's a strong chance that Russia's women could make an impact on Saturday. Even with the absence of Zavarzina, Russia has three women in the world's top ten at the moment, including Tudagesheva, who's currently the world number one. The Rostov native, who's still just 23 years old, along with the rest of her teammates, would love nothing more, than to claim victory on home soil.